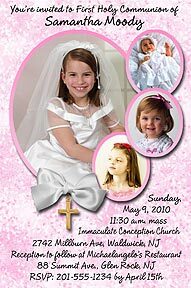 Here are some additional photo first communion invitations for you to consider. 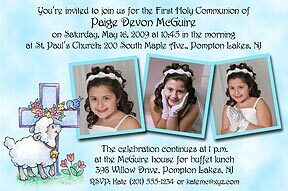 Your guests will be sure to cherish these 1st holy communion invitations that feature photos of your child. 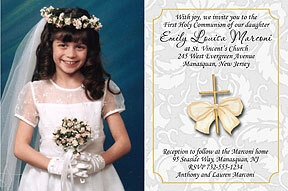 All of our designs are original, so you won't find communion photo invitations like this anywhere else. 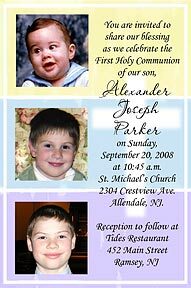 Lamb Photo Communion Invitations © Send us 3 of your favorite photos with your message and personalization. 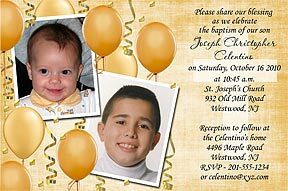 Gold Balloons Photo Communion Invitation ©Send us 2 of your favorite photos with your message and personalization. Can be made into a photo communion thank you card. 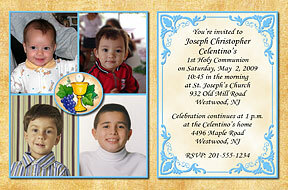 Oval Portrait Communion Invitations ©Send us 4 of your favorite photos with your message and personalization. (also available in blue) Please indicate which photo you want for the main oval. Sacred Day Photo Communion Invitations ©Send us 1 favorite photo with your message and personalization. Can be made into a photo communion thank you card. Sacrament Photo Communion Invitations ©Send us 4 of your favorite photos with your message and personalization. Specify blue (shown) or pink border.